Pete is a pilot and Frank has never flown. Today is Frank's 70th birthday and Pete takes him up flying but mid flight Pete passes out. At small airfield, Roger, picks up the Mayday call and has to teach Frank to fly mid air. MAYDAY is a 12 minute black comedy based on true events at Humberside Airport on the 9th of October 2013. 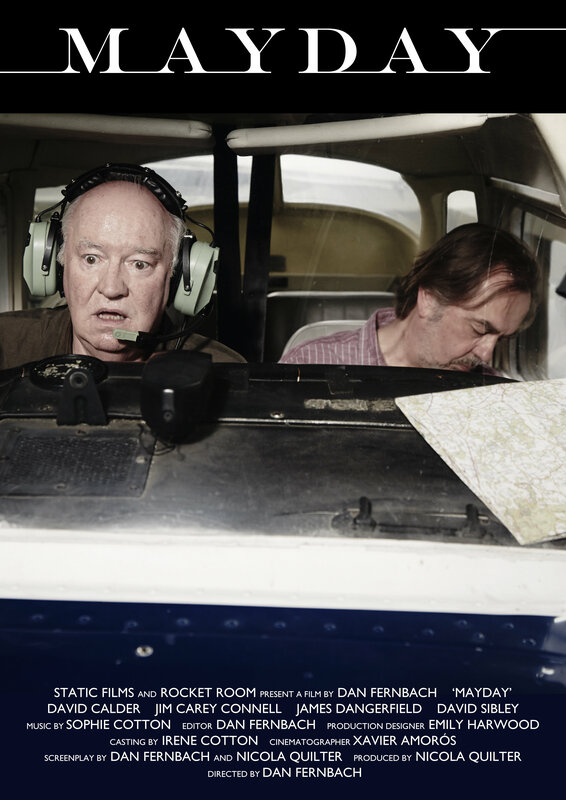 Seventy year old Frank (David Calder) is scared of flying but his friend Pete (David Sibley), an experienced pilot and owner of a two-seater plane, convinces Frank to join him on a flight. Pete passes out mid-flight and Frank has to take over the controls, desperately sending a Mayday distress call. Nick (James Dangerfield), an inexperienced air traffic controller at a small airfield, is finishing off a quiet day's work when Frank's mayday call comes over the radio. Fortunately, Roger (Jim Carey), a seasoned flying instructor and ex-RAF pilot, turns up at just the right moment and takes over the dubious task of talking Frank down from the sky. MAYDAY centres around the radio conversation between Frank and Roger as it veers from nail-biting tension to laugh-out-loud funny and back again.